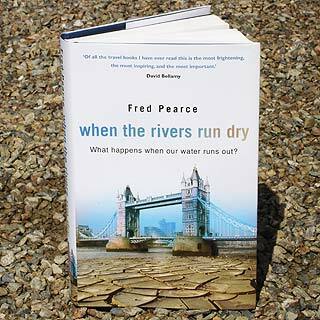 Fred Pearce is a reporter (for New Scientist, among others) and When The Rivers Run Dry is a reporter’s book (he visits places) rather than a work of theory, but he’s been following the subject for long enough to have a strong understanding of the issues. This is close to essential reading for anyone interested in the future of the planet. There’s a summary of the argument below. we are a heavily water intensive society globally, and the planet has passed the point of having enough water, on current patterns of usage, for everyone. engineering solutions (usually dams, reservoirs and canals) usually produce short term gains and serious long-term problems; and most reservoir schemes don’t get close to meeting their promised energy and/or irrigation targets. Eventually, silt does for the river scheme and salt for the land. the traditional benefits of natural rivers systems (flooding, fertilisation etc) aren’t well priced by planners and therefore are overlooked. the ‘green revolution’ has enabled us to feed most of our expanding global population but the water intensity has been high; agriculturalists are moving to a ‘more crop per drop’ model. the outlook is not good – already many areas are reverting to desert – but the most promising approaches involve simple local (and often traditional) solutions about harnessing and harvesting rainwater. I’d put water up there with global warming at top of the agenda. Many climate scientists think that our big problems with global warming will come less from the warming itself and more from the big changes in hydrology that it causes – droughts and floods, dried out soils and ecosystems, empty rivers, and maybe the worst, the sheer unpredictability of where and when we will have water. But water also defines quite well our problems in moving from a world of apparently plentiful resources – a world in which if we screw up we can move on – to a world of finite resources, where we have to manage carefully to get by. We still often see water as an essentially free and unlimited resource. But it isn’t. The public policy response to water shortages is still to build a new dam or sink a new well, with little regard for the thought that there may be no more water in the river to be captured, or underground to be pumped. There are also good reviews in Grist (“The one-word review of Pearce’s book is: Terrifying”) and Salon.